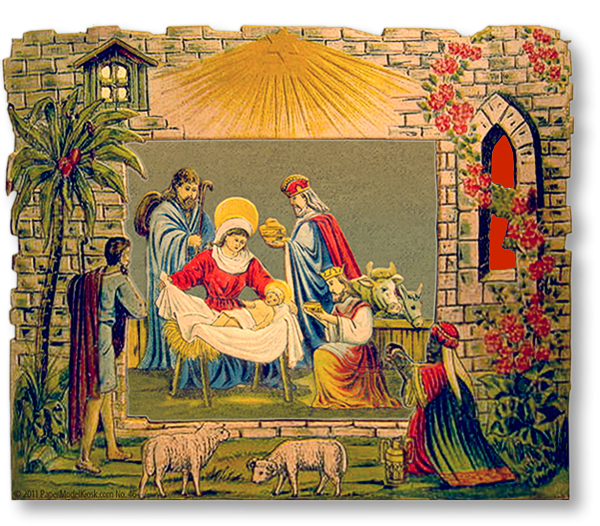 The deep relief of the vintage original can be seen on the Star Rays Miniature Nativity. The Star Rays Miniature Nativity at home on the wire-and-beads Miniature Crèche Tree. How many times have I walked past the paper aisle at the office supply store? 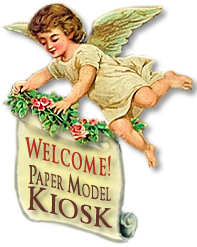 I'm sure i've looked for velum or parchment paper before, but didn't really find it until a few days ago when I started designing this miniature nativity collection and needed to cover the Gothic window at left. Look it shimmer with light! I've always said "cellophane" in the past, but this is what I really had in mind, because you might have to double and triple cellophane before you get the rich color you're after. Let's do give cellophane some love, however, because it does have its uses: just look at the luminous cellophaneJulekirkerose window. So velum — or parchment — it is, and see how beautifully it plays off the rose trellis! It's rather amazing how well this vintage nativity — with its folk-art rendering of the figures and castle-like manger — blends with the other miniatures in the collection. You can see two more — OK, one-and-a-fifth to be accurate at left: in the center, the Heurer Noël Miniature Nativity, with its brick, schoolhouse-like manger, and, at upper right, just a hint of the Three Angels Miniature Nativity. So guess who hasn't been setting up the 11-footCrèche Tree this year? All I want to do is hang just one more miniature on my 3-foot high (I'm telling you, it's something to behold! )wire-and-beads wonder. You'll just have to buy some red velum — for that Gothic window. Look how it shimmers. Size: 3.5 x 3 x 0.75 inches. Buy Star Rays Miniature Nativity as part of a collection, and save!